Nature reflects its beauty back to us in patterns - as seen in snowflakes, flower petals, cycles of the seasons and predictable patterns on butterflies and animals. We see obvious patterns around us each day and marvel over the wonder and beauty of these wondrous designs. There are also patterns in the history of humanity as well, which present themselves in historical events, natural disasters and even family history. This article will present some of these ‘not-so-obvious’ patterns for your thought and consideration. [See Strong's Concordance for Hebrew definitions]. Holy of Holiest #1688 - Debir: Inner room of a shrine temple for oracle pronouncement. 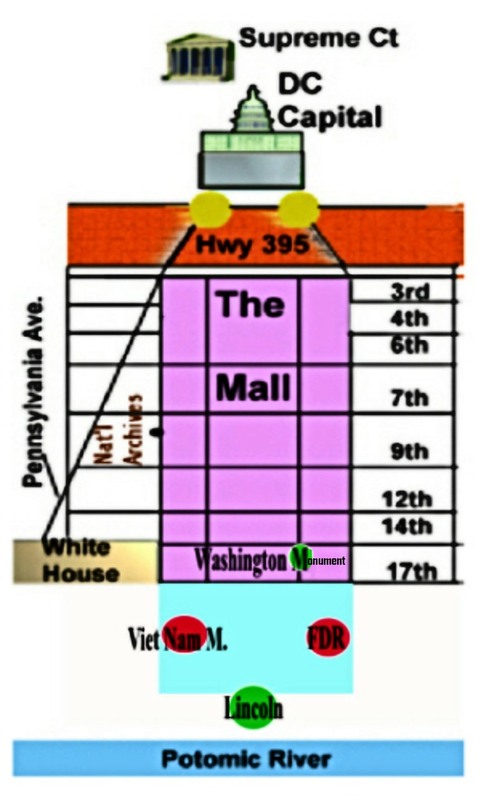 The diagram on the right shows the layout of Washington, DC. The pattern is similar to Solomon's Temple pattern, as patterns are repeated many times in history, and in many variations of use. 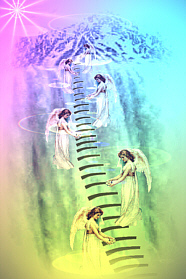 Whether you are climbing 'Jacob's Ladder', climbing the three tiered Waterfalls to the top of Mt. ZION, or ascending the evolutionary process of Soul progression via many reincarnations, the pattern is all the same. The pattern to total Ascension is a three-part process and ultimately takes us through the VEIL, where we reach the pinnacle of evolution. Here we also have direct contact with the Great Spirit, from whom all souls originate. 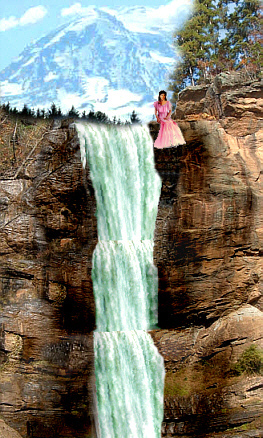 Click here for Betty's Waterfalls dream. Dimensions, as explained in "The Keeper of the Celtic Secrets"
The diagram at left depicts the pattern in the Heavens, from which all the above instances reflect. The Debir is where the Great Spirit Energy is concentrated. This area is a large energy mass within each Galaxy of the Heavens and all benevolence [of said Galaxy] flows from this concentrated source. The source of all Light, Wisdom, and Knowledge is, emitted from this High source of Energy at the top of the 3-part networking of the Galaxy. Notice the inference of an inverted pyramid shape overall in this pattern. This Highest, or Holiest, place in the Heavens is, reflected in the Debir, where the Ark of the Covenant is stored. There is a Veil that separates the 2nd and 3rd levels of this natural pattern and is, likened unto a door, in which one must find and enter therein, to obtain complete Ascension. 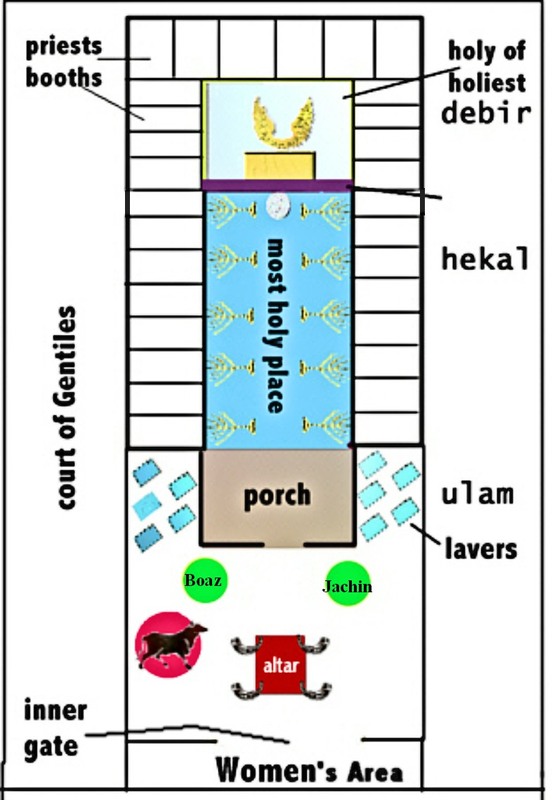 The center oval-type cycle is reflected in the 'stairway', the ladder, the Temple, and the Tabernacle, as the middle section of the pattern. This is the pattern for the Hekal area, where Spiritual tools, which will assist us to the higher realm of the pattern process, become apparent. The smaller circle at the bottom depicts our Solar System with the Earth orbiting its star, the Sun. This cycle of things represents the Ulam pattern or all things physical - material - animal-like - the Ego. Remember, this is the pattern of all such things and is reflected from the Heavens. The red circle showing a white cross represents the planet of crossing, Hibiru, or Nibiru, as some believe. Hibiru is the home to the ancient gods of Sumer and Egypt. These gods were idealistically, our teachers, but man has not recognized the patterns revealing truth and light, but rather, man has invented his own 'truths' instead. For more on the Heavenly Pattern be sure to read "Keeper of the Celtic Secrets" by Betty Rhodes. The wheel to the left was first taught to the descendants of Hibiru, by their fathers, the ancient gods of Sumer and Egypt. Today, this pattern reveals the descendants of the Elohiym, who are found in the land of the Eagle, the Bull, the Lion, and excel in the 'Spirit' of Intelligence and Scientific Enlightenment - Aquarius. The 'chosen' people, i.e. the descendants of the Elohiym, were to be scattered to the four corners of the Earth. These four 'corners' reflect the four elements in nature, fire, water, earth and air. 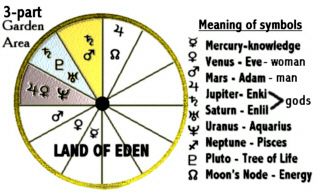 The chart on the right shows the three-parts of the Garden of 'Eden' with the rulers of each section. The 'rulers' are planets, and as astrological rulers, they reveal the patterns of all things on earth, the history of mankind and they also show the future of all things. Patterns repeat throughout time and are predictable. More on the Land of Eden Chart on page two of 'patterns'. The chart on the left shows the identity of the three major tribes of Manasseh, Judah, and Ephraim. It also shows the combined and unified assembly of the tribes, known as the Israelites, or the Hebrew people. During the Age of Aquarius we find the unified efforts of all 13 tribes of Israel taking place for the good of the world. Each tribe is defined by their astrological markers and can easily be identified as such. 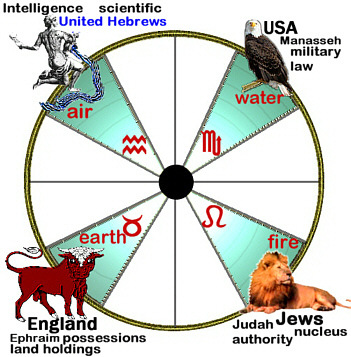 The tribe of Manasseh was to be a military might and a leader at enforcing the law on the nations - this power is identified by the astrological sign of Scorpio, a water sign. Ephraim acquires much land holdings as possessions, and are the stable, persistent element in the world, when at their best. Jerusalem has always been at the center, or nucleus, of three major religious cultures. Jerusalem maintains mental power, leadership, and authority in these rights - in spite of what others say - for it is written in the stars. The culmination of all Israel takes place in the Age of Aquarius - which is NOW. We see the unification of the tribes working together to bring world peace, democracy, freedom, and more idealistic situations. Today, it is no longer necessary for the tribes to be gathered together in one central location, for they can best serve humanity by being scattered [but unified] across the globe.